The Bachmann On30 Shay was an early addition to the 0n30 range and its been in the range since around 2002. In that time there have been several versions and some revisions. 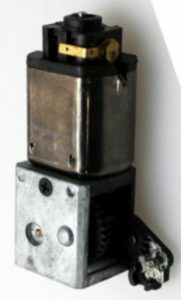 It was first released in the standard green cardboard box as a DC silent model, but with a DCC socket, and it sold like hot cakes. To add sound you bought a Soundtraxx LC series decoder specifically made to fit in the bunker. 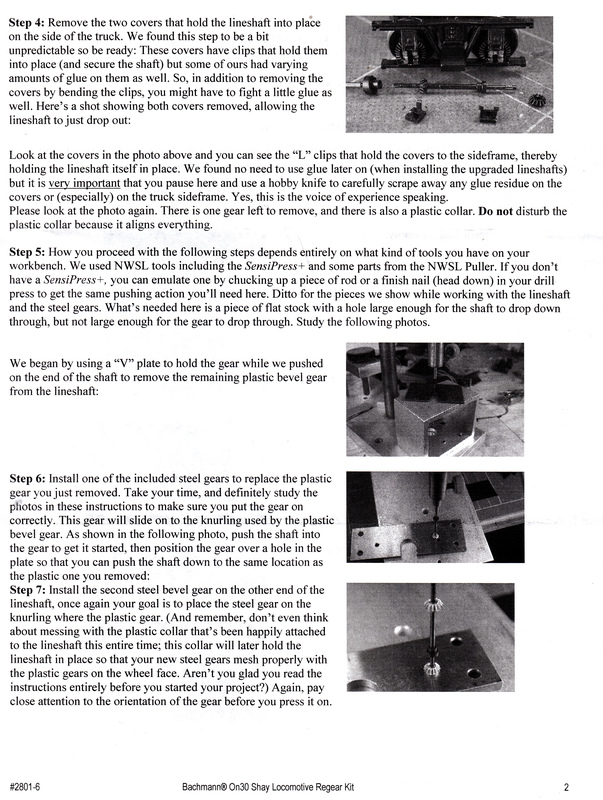 Provision was made in the standard model for a 1 inch diameter speaker. With Bachmann still saying they weren’t going to do sound it was down to Soundtraxx to produce ready to run sound fitted models. Soundtraxx bought a load of Shay, Climax and 2-8-0 models from Bachmann, fitted sound using the new Tsunami technology decoders and resold them as RtR sound fitted models. These were characterised by a blue and white Soundtraxx sleeve over the standard green box. This clearly had an impact on Bachmann as in no time they had done a deal with Soundtraxx to licence the Tsunami sound and offer sound fitted loco’s directly from the production lines in China. This led to the last distinction on boxes. All versions moved in to the card boxes with a window front with the model in a blister pack inside but the key was the colour of the box. 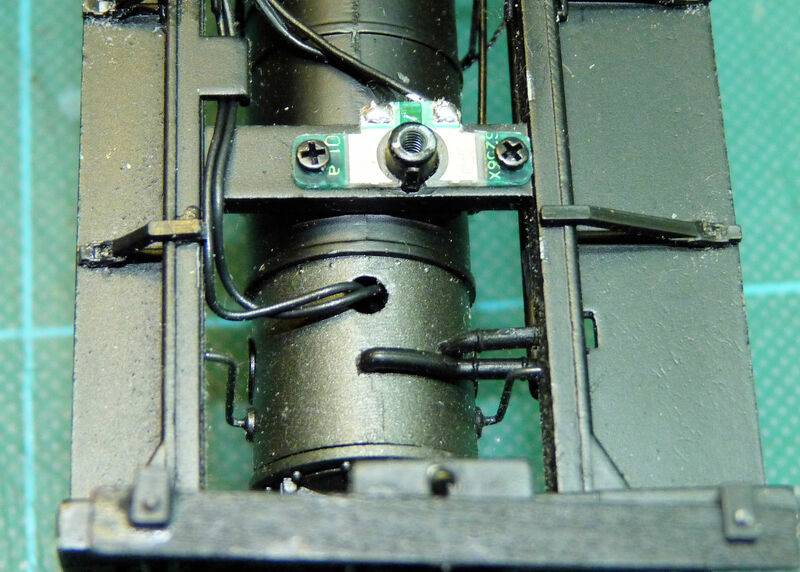 Green Boxes were DCC ready models whilst brown boxes denoted sound fitted models. 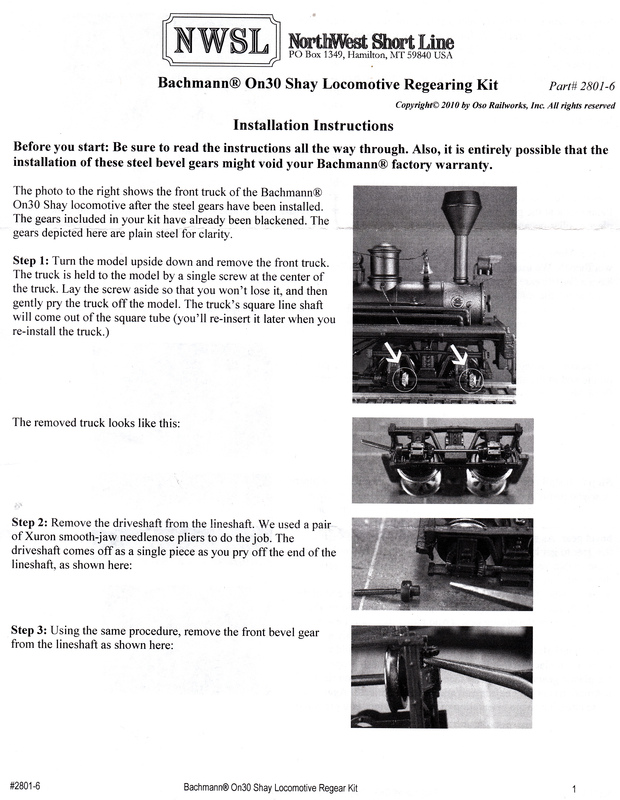 As this is typed, (October 2015), the Shay is currently not in the Bachmann catalogue. Usually the form is that a model is rested and then re-introduced upgraded or in a different version. It should perhaps be no surprise that over the years its been in production there have been some issues with the Shay. Think about it, if the Shay was an easy prototype it would have been modelled ready to run much sooner instead of remaining the domain of expensive kits and brass models. The links below will take you to sections on each of the problems and how to deal with them. Initially there wont be much on the links as it will take time to populate them. I hope this doesn’t end up like a page knocking the Shay. That is not my intention but in detailing the issues and adding notes on how to deal with them it may end up looking like that. Perhaps I’ll have to add some pictures of conversions and customisations to balance it out. Early in the history of the Shay there were tales of motors burning out. 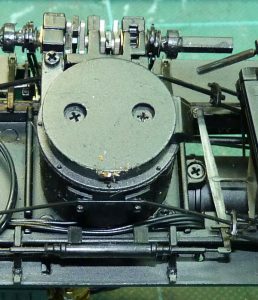 The cause was over enthusiastic oiling of the top bearing of the motor in the factory causing the motor to burn out when the commutator got contaminated with oil. I guess part of the problem may have been the unusual arrangement of the motor being vertical so that gravity did its stuff. There is another issue though when it comes to lubrication. 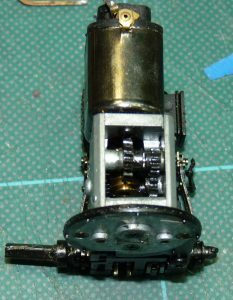 Most of the gears in the gearbox get some oil if you oil the final drive gear on the outside of the loco by trailing it through the gear chain. 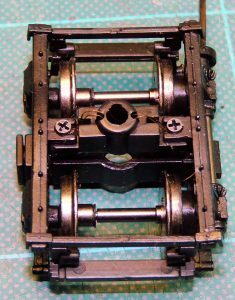 However there is a layshaft in the gearbox that means the worm and spur gear get dry. To fix it you have to drop the motor out as shown but its a once in a lifetime job if you use the right lubricants. Upend your loco in a cradle or some other secure way of holding it and remove the two screws that hold the cosmetic ash pan noting that the door (beak like thing) is to the rear Remove the two screws near the edge of the circle (don’t touch the others) Disconnect the truck drive shafts as you draw the motor downwards. You will have to unclip the truss rods as you do this. As you can see here there are two lines of gears. 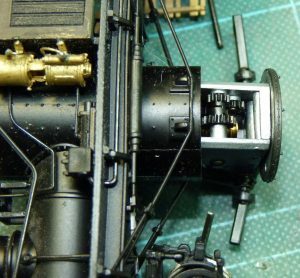 This view shows a gearbox completely removed from the loco. A is the worm driving a spur gear on a layshaft. No lubrication applied externally can get to this so add some grease to these gears and run the motor gently to ensure it gets all round. Add some runny oil to the spur gear spindle Line B of gears does eventually end up externally so in theory at least oil applied to the external gear will make its way through the chain. 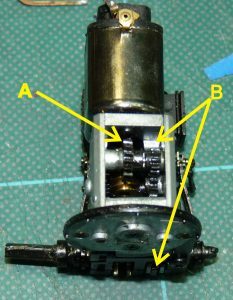 When you are happy that you have oil or grease all around it and that the gearbox is running sweetly you can put the motor back in the engine by reversing the strip down process. 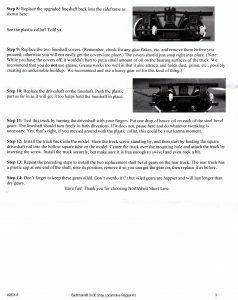 If you have used Nano-Oils and Grease as described here Anti-Squeak this should be a one of application you don’t have to repeat. 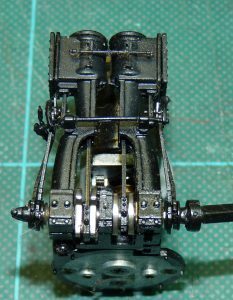 There is no inherent issue with the valve gear on the model but there are three things to keep an eye on whilst you are servicing your Shay. Check the valve rods don’t some loose. As you can see from this diagram they aren’t a complete circle and only clip around the eccentric on the crank shaft. If they come loose try to gently give them a squeeze closed. Watch out for fluff and hair getting caught in the cranks shaft. The design seems prone to collecting junk and particularly likes mowing static grass. I’ve had more than one come past my bench where the crank can barely turn for hair wrapped around the crankshaft. If the first two items in my “care and feeding” list were incidental and things to keep an eye on we now get down to the two big ones. Power collection on the Shay is, theoretically at least, quite clever as it uses split frame pick ups and wiper contacts to transfer the power from the wheels, through the trucks and up to the body. In practice it leaves something to be desired in a silent model and a lot to be desired in a sound fitted model. It is the dodgy power collection that makes for stuttering sound. 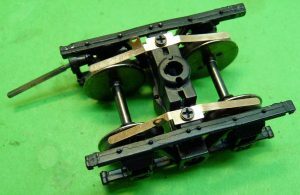 Split frame is fine and applied properly works very well but not when you expect current to flow from the steel axle ends in to mazak (not noted for its conductivity) frames and then flimsy wipers to the body. 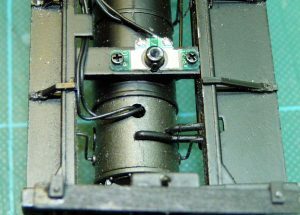 Over time the end of the axles create a sort of gooey paste in the cast mazak side frames which doesn’t conduct electricity and the flimsy wires wiping on the PCB’s on the underframe introduce more electrical noise into the systems. If on DCC adding keep alive circuits can help but a keep alive unit has to draw power to charge itself up so it only really helps across interruptions of power so it is still better to fix the power collection first. Shay was released produced by the On30 guy but they haven’t been available for some time. I bought a stock back then but having used all mine up and unable to get more I drew my own version and had them etched. These will be on my website shortly for sale. 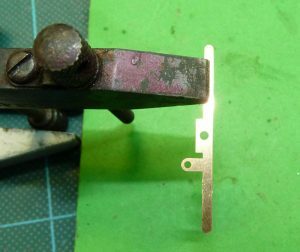 They are very easy to fit but you do have to be able to solder quite finely to attach the wires to the pickup and underside of the loco. 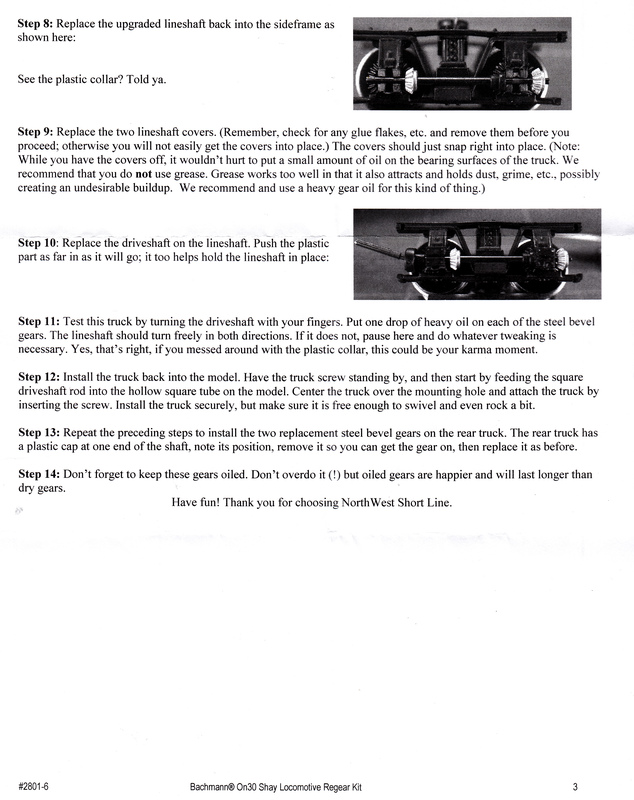 Here are the easy steps to fitting these pickups. First thing is cutting them out from the etch and cleaning them up. Writing this for the instructions to include with them started the tools & skills thread here on the blog. You need to cut them from the fret with as little tag left behind as possible. I do it variously with a sharp knife on a cutting block or with a pair of surgical scissors I blagged when my leg was hurt and needed dressing regularly (the nurse was opening sterile scissors using them once and binning them, I intercepted them). You then need to file the edges to remove the last of the tags. To do that you need to hold them. 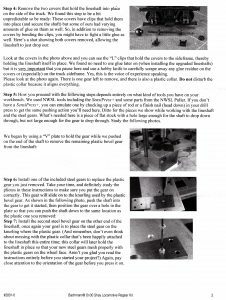 A tool makers clamp is best but have a read of getting a grip on the tools & skills page if you are in any doubt. 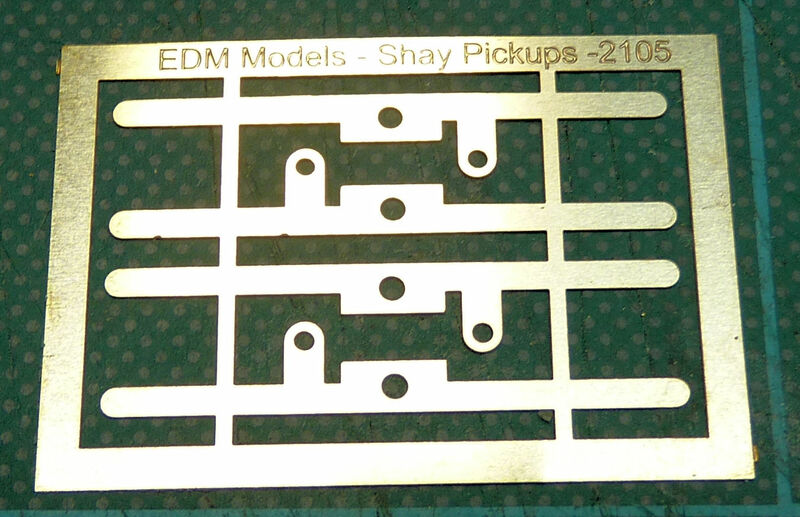 Next task is to bend them to shape and solder on the wires as shown in this picture. If you can solder neatly you can solder the wires near the main body of the pickup and snip the surplus tag off. 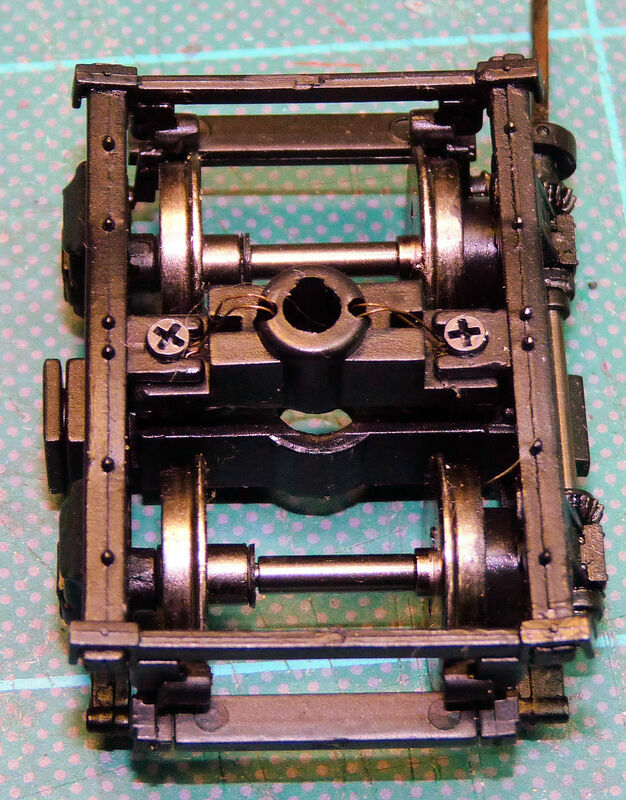 Here I have coloured the pickups so they will be hardly visible when on the loco. You could use paint but these were just done with a marker pen. Next task is to fit them to the trucks. 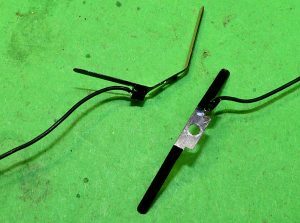 Remove the two screws on the top of the trucks and pull off the original wiper wires. 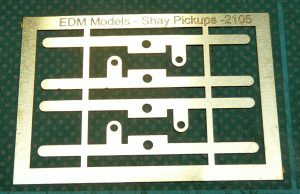 Fit the pickups using the screws through the holes which you may have to ease with a broach to give yourself a bit of wiggle room when aligning the pick ups onto the treads. Be careful when you tighten the screws to not go too far or the screws compress the pickup into the slot on the casting and deform them.